Is Jordan's Muslim Brotherhood Still the Loyal Opposition? Until the 1990s, the Jordanian branch of the Muslim Brotherhood had been a tacit ally of the Hashemite monarchy. That close relationship has deteriorated, triggered in large degree by King Hussein's (R) decision to recognize and make peace with Israel in 1994. 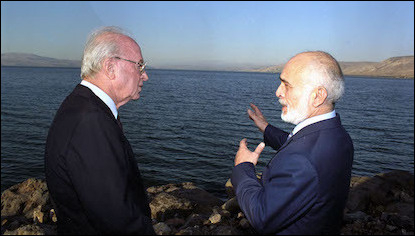 He is seen here with Israeli prime minister Yitzhak Rabin. The Muslim Brotherhood in Jordan, the key Islamist movement in the country, has had a long-standing symbiotic relationship with the monarchy and, until recently, was not considered a threat to the survival of the Hashemite Kingdom. But the rise and fall of the Muslim Brotherhood in Egypt and the growth of militant Islamist groups such as the Islamic State (ISIS) have alarmed the monarchy and led to a drastic shift in the nature of its relations with the Brotherhood from coexistence to persecution. Will the Jordanian regime be able to contain the Islamists and, in turn, will the Brotherhood choose to challenge the throne rather than to acquiesce in its continued suppression? Probably the foremost Islamist movement in the Middle East, the Muslim Brotherhood was founded in 1928 in Egypt. From there, it spread to other parts of the region including Jordan (1946) where it was incorporated into the kingdom's social and political fabric with some of its members even serving in cabinet. The group reciprocated by refraining from challenging the regime as had its founding organization in Egypt. Bilateral relations warmed substantially during King Hussein's long reign (1952-99) when the Brotherhood often functioned as a bulwark against anti-Hashemite forces. This was particularly evident during the heyday of pan-Arabism when Egyptian president Gamal Abdel Nasser—who politically opposed the Egyptian Brotherhood—repeatedly sought to subvert the Hashemite monarchy. 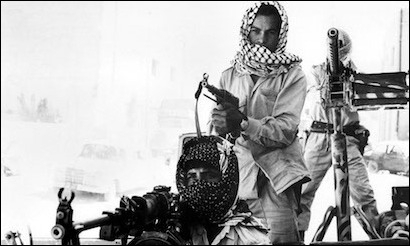 The Muslim Brotherhood provided support to the Jordanian monarchy during the 1970 Black September uprising when the regime's existence was threatened by Palestinian guerrillas like these seen here near Amman. The Brotherhood also provided support to the monarchy during the 1970 Black September events when the regime's existence was threatened by the Palestinian guerrillas encamped on its territory. And although political parties were banned between 1957 and 1992, the Brotherhood was able to function and attract new recruits since it was registered under the law of charitable clubs and associations. With the legalization of political parties in 1992, the organization established its political wing, the Islamic Action Front (IAF). provides one of the few cases of an Arab government and Islamic movement pursuing a non-confrontational political strategy over an extended period. Traditionally, the Muslim Brotherhood has played not so much the role of opposition, but of virtual ally and, at times, of client to the king. This symbiotic relationship prevailed into the 2000s regardless of occasional frictions emanating from domestic and regional vicissitudes. The 1994 Jordanian-Israeli peace treaty, for example, triggered a heated debate between the "hawks" opting to confront the regime over the issue and "doves" urging conciliation yet failed to fracture the Brotherhood's overall relationship with the monarchy. Likewise, the organization remained aloof vis-à-vis the post-9/11 measures taken by King Abdullah II—who had succeeded his father two years earlier—against the kingdom's militant Salafist movement urging the overthrew of the "infidel" monarchy. Unlike the Salafists, the Jordanian Brotherhood and its political arm, the IAF, have never had an overtly militant wing despite its organic link with and support for Hamas, the Palestinian Muslim Brotherhood branch. This restraint notwithstanding, relations began to sour following the November 2005 hotel bombings in the Jordanian capital of Amman, which left sixty people dead and 115 wounded. Organized by Abu Musab Zarqawi, a native Jordanian from the Salafist stronghold of Zarqa and leader of al-Qaeda in Iraq (AQI) from which the Islamic State would spring, the bombings provoked a storm of anti-Salafism on the streets of Amman but could not hide the fact that increasing numbers of Jordanians had some jihadist sympathies. Though the Brotherhood had nothing to do with the attack, the Hashemites, always nervous about the stability of their throne, grew ever more suspicious of anything smacking of Islamism. These concerns increased with the 2006 election of the hawkish Zaki Bani Irshid as the Brotherhood's deputy general-secretary and Hammam Said as the IAF's new leader, signaling to King Abdullah II an unwelcome shift. The king looked across the Jordan to see Hamas win the Palestinian parliamentary elections and taking full control of the Gaza Strip and did not like what he saw. This was especially troubling as there was a growing apprehension that the broader Muslim Brotherhood now "look[ed] to Jordan as an avenue for expanding its regional influence." approach toward the regime, thus further widening the rift between the Brotherhood and the monarchy. The king's claim to religious legitimacy [has traditionally been] based on his descent from the Prophet, distinguishing his rule from that of Tunisian and Egyptian counterparts ... Jordan offers a more complex set-up, in which Islamic activism and communal loyalties [referring to the Palestinians in particular] are to a certain extent connected or interrelated. The monarchy's distinguished origin also enabled it to use Islam as an integral part of its foreign policy, notably its demand for managing the al-Haram al-Sharif holy site (and by extension—to rule East Jerusalem and the West Bank). Consequently, not only did the Brotherhood pose no existential threat to the Hashemite throne, but the regime has actually used the organization as a crutch at critical moments. But Jordanian society also consists of two main ethnic groups: the indigenous East Bank (Transjordanian) Bedouin tribesmen and the Palestinian-Jordanians, incorporated into the kingdom in the aftermath of the 1948 war, who came to form the majority of the kingdom's population and its economic bedrock. Notwithstanding their importance for securing the demographic and economic viability of the nascent Hashemite kingdom, Palestinian-Jordanians have been systematically marginalized and discriminated against, with their Bedouin compatriots constituting the mainstay of the regime and controlling the kingdom's political institutions and security organs. Tensions between the two communities intensified after the 1967 war as the kingdom was flooded by fresh waves of West Bank Palestinian refugees, shooting to new heights in the wake of the 1970 Black September events when Jordanians of Palestinian descent came to be increasingly perceived as a potential threat to the survival of the monarchy. Relations worsened with the signing of the Israeli-Jordanian peace treaty in 1994, a weakening which, simply put, represents more of a Palestinian sentiment than an East Banker Transjordanian one. The Muslim Brotherhood has been increasingly reliant on the votes of Palestinian-Jordanians. However, a closer look at the composition of the Jordanian Brotherhood demonstrates that both the Brotherhood and the IAF were increasingly reliant on the votes of Palestinian-Jordanians. Thus, for instance, while in the 1989 elections, 16 of the Brotherhood's 22 deputies were elected from districts with a Transjordanian majority, in the 2003 elections, only 5 of its 17 deputies came from such districts. Indeed, the prevailing tension between the old and new Brotherhood is largely an offshoot of the internal split over the movement's "priorities and identities," namely perceived Palestinian needs versus those of the Hashemite-allied Transjordanians. The recent public anger at the lack of sufficient political reform has exacerbated domestic instability in Jordan over the past few years. But a new twist came to light with the appearance of opposition from the East Bank-based, largely tribal Hirak movement, which led street protests in Jordan. This may represent the most immediate challenge to the kingdom, considering that it was coordinated through East Bankers whose loyalty was long considered set in stone. Palestinians and even radical Islamists, by contrast, represent more of a potential threat than a present one. On one hand, it was East Bank activism that gave rise to a strong opposition during the heyday of the Arab uprisings, as it previously was during the 1989 and 2002 riots in Jordan; on the other, it is the radical/jihadi Islamist groups that pose a real threat to the survival of the monarchy. In this regard, the alienation or weakening of the Muslim Brotherhood—with its long history of "loyal opposition" in the kingdom—and other moderate Islamist groups might have detrimental effects on the monarchy given the rise in radical Islamist activism across Jordan's borders. The upheavals that have engulfed the Middle East from late 2010 found resonance in Jordan although public protests were never allowed to disrupt the country's functioning. In January 2011, thousands of Jordanians followed the example of protesters in Tunisia and Egypt and staged massive demonstrations in Amman, protesting high prices for staples, soaring unemployment, perceived government corruption, and a general lack of democracy. With the crowds directing much of their anger against Prime Minister Samir Rifai rather than King Abdullah, the crown was able to placate the protesters somewhat, first by announcing subsidies for basic goods and then by dismissing Rifai. Following the Arab upheavals, the Brotherhood never came close to demanding a complete regime change. Despite their late participation in public rallies, the Brotherhood's demands for political change were relatively moderate. They insisted on structural changes to the constitution, including constraining the monarchy's power, removing the king's ability to dissolve parliament, and preventing him from appointing a prime minister without parliamentary consent. Yet they refrained from going beyond previous acts of protest such as boycotting the parliamentary elections of 1997, 2010, and 2013 to test the boundaries of the regime's tolerance; neither did they ever come close to demanding a complete regime change as in other regional hotspots at the time. 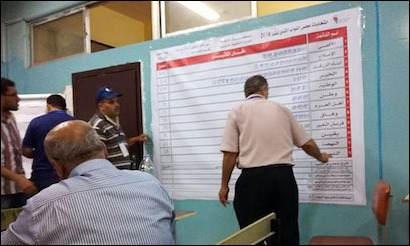 Ballot sorting during the 2016 Jordanian elections. Tensions with the Hashemite monarchy came to a head when the Muslim Brotherhood and its political wing boycotted the 2013 parliamentary elections. They also boycotted elections in 1997 and 2010 but agreed to participate in September 2016. However, the growing splits within the Brotherhood, as well as the regime's changing perception of the movement, fostered an attitude of mutual suspicion that gradually replaced the longstanding non-confrontational relations between the group and the monarchy. Tensions came to a head when the Brotherhood and the IAF decided to boycott the January 2013 parliamentary elections, the first after the outbreak of the Arab uprisings. The groups' subsequent withdrawal from the National Dialogue Committee, set up for political reform after public rallies, furthered the strains. Then came the rise and fall of Egypt's Muslim Brotherhood government under President Muhammad Morsi and the movement's subsequent labeling as a terrorist organization by Saudi Arabia in December 2013 and the United Arab Emirates in November 2014. When the Brotherhood's Bani Irshid attacked the Emirates' decision in a Facebook post, he was excoriated for "endanger[ing] 225,000 Jordanians living in the Emirates" and peremptorily put on trial in February 2015 under the anti-terrorism law for "disrupting relations with a foreign state." 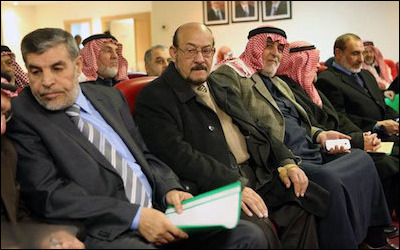 In February 2016, the Jordanian government declared the Muslim Brotherhood an illegal organization and licensed a new Brotherhood under the leadership of Abdul Majid Thunaibat (2nd from left). A year later, in February 2016, the Jordanian government declared the Brotherhood an illegal organization and licensed a new Brotherhood under the leadership of Abdul Majid Thunaibat, a senior movement member of Trans-Jordanian origin (i.e., non-Palestinian). The following month the IAF's Aqaba office was ransacked, and, in April, the Brotherhood's offices in Amman and Jerash were closed, followed by those in the towns of Madaba, Karak, and Mafraq. The closures were linked to the implementation of a court decision "to transfer properties of the 'unlicensed' Muslim Brotherhood to the rival splinter group." The formation of the "new" Brotherhood, which attempted to re-register as the real Brotherhood and disassociate itself from its Egyptian parent organization, led to a questioning of the movement's status in the kingdom with the old Brotherhood insisting on its right to continue to operate and Prime Minister Abdullah Ensour disputing this right, arguing that the "Brotherhood in Jordan is illegal. It does not have a license of community statute and missed the right of legitimacy." Clearly, the nature of the longstanding relationship between the throne and the Brotherhood had been transformed. With the onset of the Arab uprisings, the kingdom found itself in a delicate situation coping not only with growing internal opposition but also fighting the ascendancy of Islamist militancy and the escalation of radical jihadist movements such as ISIS and Jabhat an-Nusra on the other side of its borders with Syria and Iraq. Among the effects of the Syrian civil war on Jordan, the foremost challenge has been the mass influx of Syrian refugees and their integration into Jordanian society. The presence of refugees has exacerbated the kingdom's existing economic problems. The thousands of Jordanians who attended public rallies in the wake of the Arab upheavals were not only complaining about lack of progress in democratic reform but were protesting a worsening economic environment that had accompanied the influx of Syrian refugees. The war in Syria has increased internal instabilities and doubled the challenges the kingdom faces at the regional level. Moreover, deepening political divisions within the country have been reflected in popular and vocal disagreement regarding the future of Syria. While Jordanian Salafi jihadists support the overthrow of Bashar al-Assad, nationalists and leftists want the kingdom to refrain from any involvement in Syrian internal affairs. Still, others favor a peaceful transition that sees the gradual removal of the Assad regime. In such a divided society, the kingdom must pursue a cautious course of action, one that reduces the likelihood of military intervention. In addition, Jordan has been frustrated by Islamist activism and the rising influence of Salafists, including some who fought in Syria. According to Muhammad Shalabi (Abu Sayyaf), a prominent Jordanian jihadist, between 700-800 Jordanians have joined the fighting in Syria, many of whom had fought previously in Afghanistan and Iraq. By most estimates, Jordanian Salafists number around five thousand though some believe the actual number to be as high as 15,000. Thus, the war in Syria has not only increased internal instabilities but has doubled the challenges the kingdom faces at the regional level as well. The Jordanian Muslim Brotherhood has historically been considered a "loyal opposition" that can play a useful role within the kingdom's political system even when its relations with the regime soured following the conclusion of the Jordanian-Israeli peace treaty. But the Arab upheavals, especially the Syrian civil war, have forced the regime to strike a delicate balancing act between the need to clamp down on the rising tide of Islamist militancy and the desire to preserve the continued acquiescence of the more moderate Islamist elements in the rules and values of the political system. Thus far the kingdom has managed to co-opt radical Islamist groups, including the Salafists, thanks to its relationship with the Brotherhood and its divide-and-conquer policies. It is, therefore, likely to do all that it can to keep the organization in its fold and to refrain from declaring it a terrorist group despite pressures from its Persian Gulf allies to do so. The IAF's decision to participate in the September 2016 elections and its reported severance of relations with the Egyptian Brotherhood suggest that they, too, seem to recognize the need to continue to operate within the confines of the Jordanian political system. Nur Köprülü received her PhD degree at the Middle East Technical University (METU), Ankara, in the field of international relations with a focus on Jordan, and heads the Department of Political Science at the Near East University, Nicosia. Jillian Schwedler, "The Quiescent Opposition," The Wilson Center, Washington, D.C., Aug. 27, 2015. Gudrun Krämer, "The Integration of the Integrists: A Comparative Study of Egypt, Jordan and Tunisia," in Democracy without Democrats? The Renewal of Politics in the Muslim World, ed. Ghassan Salamé (London: I.B. Tauris, 1994), p. 219; see, also, Curtis C. Ryan, "Islamist Political Activism in Jordan: Moderation, Militancy, and Democracy," Scholars for Peace in the Middle East Reports, June 2008, p. 3. Author interview with Zaki Bani Irshid, Jordanian Brotherhood's deputy general-secretary, IAF Headquarters, Amman, Nov. 9, 2010; author interview with Orab Rantawi, director of the Amman-based al-Quds Center for Political Studies, Amman, Nov. 8, 2010. Robert Satloff and David Schenker, "Political Instability in Jordan: Contingency Planning Memorandum No. 19," Council on Foreign Relations, New York, May 2013, §6. Krämer, "The Integration of the Integrists," p. 219. Mudar Zahran, "Jordan Is Palestine," Middle East Quarterly, Winter 2012, pp. 3-12. David Siddharta Patel, "The more things change, the more they stay the same: Jordanian Islamist responses in spring and fall," Project on U.S. Relations with the Islamic World, Rethinking Political Islam Series, Brookings Institute, Washington, D.C., Aug. 2015, p. 6. Al-Monitor (Washington, D.C.), May 12, 2015; David Schenker, "Amman's Showdown with the Muslim Brotherhood." The Washington Institute, Washington, D.C., Apr. 6, 2016. Shmuel Bar, The Muslim Brotherhood in Jordan (Tel Aviv: The Moshe Dayan Center for Middle Eastern and African Studies, 1998), p. 19. The New York Times, Feb. 1, 2011. Tareq al-Naimat, "The Jordanian Regime and the Muslim Brotherhood: A Tug of War," Viewpoints, July 2014. Ibid; Patel, "The more things change," p. 3. Hasan Abu Haniyeh, "Jordan's strategy to fragment the Muslim Brotherhood," Middle East Eye (London), Apr. 19, 2016. The Jordan Times (Amman), Apr. 14, 2016. TRT Haber TV (Istanbul), July 6, 2015; al-Monitor, Mar. 3, 2015, May 12, 2015. Khaled Waleed Mahmoud, "Where Does Jordan Stand on the Syrian Crisis?" Middle East Monitor, Sept. 16, 2013. Mona Alami, "Jordanian jihadists are on the rise," The Daily Star (Beirut), Mar. 4, 2014. The Jerusalem Post, Oct. 21, 2012; Al-Monitor, Apr. 23, 2013. The Jordan Times, June 11, 2016. Related Topics: Jordan | Spring 2017 MEQ receive the latest by email: subscribe to the free mef mailing list This text may be reposted or forwarded so long as it is presented as an integral whole with complete and accurate information provided about its author, date, place of publication, and original URL.